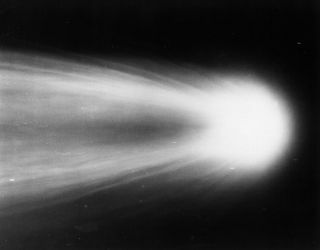 Halley's Comet as photographed May 8, 1910, by Dr. G.W. Ritchey using the 60-inch (1.5-meter) telescope at Mount Wilson Observatory, Calif., during the comet's last appearance. The head of the comet and the beginning of its long tail are shown. Short, straight streaks are background stars. Comets are icy bodies in space that release gas or dust. They are often compared to dirty snowballs, though recent research has led some scientists to call them snowy dirtballs. Comets contain dust, ice, carbon dioxide, ammonia, methane and more. Astronomers think comets are leftovers from the material that initially formed the solar system about 4.6 billion years ago. Some researchers think comets might have originally brought some of the water and organic molecules to Earth that now make up life here. To research this hypothesis, the Rosetta mission, which landed a probe on a comet on Nov. 12, 2014, is studying its nucleus and environment, observing how it changes as it approaches the sun. Comets orbit the sun, but most are believed to inhabit in an area known as the Oort Cloud, far beyond the orbit of Pluto. Occasionally a comet streaks through the inner solar system; some do so regularly, some only once every few centuries. Many people have never seen a comet, but those who have won't easily forget the celestial show. The solid nucleus or core of a comet consists mostly of ice and dust coated with dark organic material, according to NASA, with the ice composed mainly of frozen water but perhaps other frozen substances as well, such as ammonia, carbon dioxide, carbon monoxide and methane. The nucleus may have a small rocky core. As a comet gets closer to the sun, the ice on the surface of the nucleus begins turning into gas, forming a cloud known as the coma. Radiation from the sun pushes dust particles away from the coma, forming a dust tail, while charged particles from the sun convert some of the comet's gases into ions, forming an ion tail. Since comet tails are shaped by sunlight and the solar wind, they always point away from the sun. Comet tails may spray planets, as was the case in 2013 with Comet Siding Spring and Mars. At first glance, comets and asteroids may appear very similar. The difference lies in the presence of the coma and tail. Sometimes, a comet may be misidentified as an asteroid before follow-up observations reveal the presence of either or both of these features. The nuclei of most comets are thought to measure 10 miles (16 kilometers) or less. Some comets have comas that can reach nearly 1 million miles (1.6 million km) wide, and some have tails reaching 100 million miles (160 million km) long. We can see a number of comets with the naked eye when they pass close to the sun because their comas and tails reflect sunlight or even glow because of energy they absorb from the sun. However, most comets are too small or too faint to be seen without a telescope. Comets leave a trail of debris behind them that can lead to meteor showers on Earth. For instance, the Perseid meteor shower occurs every year between August 9 and 13 when Earth passes through the orbit of the Swift-Tuttle comet. Astronomers classify comets based on the durations of their orbits around the sun. Short-period comets need roughly 200 years or less to complete one orbit, long-period comets take more than 200 years, and single-apparition comets are not bound to the sun, on orbits that take them out of the solar system, according to NASA. Recently, scientists have also discovered comets in the main asteroid belt — these main-belt comets might be a key source of water for the inner terrestrial planets. Scientists think short-period comets, also known as periodic comets, originate from a disk-shaped band of icy objects known as the Kuiper Belt beyond Neptune's orbit, with gravitational interactions with the outer planets dragging these bodies inward, where they become active comets. Long-period comets are thought to come from the nearly spherical Oort Cloud even further out, which get slung inward by the gravitational pull of passing stars. In 2017, scientists found there may be seven times more big long-period comets than previously thought. Some comets, called sun-grazers, smash right into the sun or get so close that they break up and evaporate. Some researchers are also concerned that comets may pose a threat to Earth as well. Comet McNaught C/2009 R1 was visible on June 6, 2010. In general, comets are named after their discoverer. For example, comet Shoemaker-Levy 9 got its name because it was the ninth short-periodic comet discovered by Eugene and Carolyn Shoemaker and David Levy. Spacecraft have proven very effective at spotting comets as well, so the names of many comets incorporate the names of missions such as SOHO or WISE. In antiquity, comets inspired both awe and alarm, "hairy stars" resembling fiery swords that appeared unpredictably in the sky. Often, comets seemed to be omens of doom — the most ancient known mythology, the Babylonian "Epic of Gilgamesh," described fire, brimstone, and flood with the arrival of a comet, and the Roman emperor Nero saved himself from the "curse of the comet" by having all possible successors to his throne executed. This fear was not just limited to the distant past — in 1910, people in Chicago sealed their windows to protect themselves from what they thought was the comet's poisonous tail. For centuries, scientists thought comets traveled in the Earth's atmosphere, but in 1577, observations made by Danish astronomer Tycho Brahe revealed they actually traveled far beyond the moon. Isaac Newton later discovered that comets move in elliptical, oval-shaped orbits around the sun, and correctly predicted that they could return again and again. Chinese astronomers kept extensive records on comets for centuries, including observations of Halley's Comet going back to at least 240 B.C., historic annals that have proven valuable resources for later astronomers. A number of recent missions have ventured to comets. NASA's Deep Impact collided an impactor into Comet Tempel 1 in 2005 and recorded the dramatic explosion that revealed the interior composition and structure of the nucleus. In 2009, NASA announced samples the Stardust mission returned from Comet Wild 2 revealed a building block of life. In 2014, the European Space Agency's Rosetta spacecraft entered orbit around Comet 67P/Churyumov-Gerasimenko. The Philae lander touched down on Nov 12, 2014. Among the Rosetta mission's many discoveries was the first detection of organic molecules on the surface of a comet; a strange song from Comet 67P/Churyumov-Gerasimenko; the possibilities that the comet's odd shape may be due to it spinning apart, or resulting from two comets fusing together; and the fact that comets may possess hard, crispy outsides and cold but soft insides, just like fried ice cream. On Sept. 30, 2016, Rosetta intentionally crash-landed on the comet, ending its mission. Halley's Comet is likely the most famous comet in the world, even depicted in the Bayeux Tapestry that chronicled the Battle of Hastings of 1066. It becomes visible to the naked eye every 76 years when it nears the sun. When Halley's Comet zoomed near Earth in 1986, five spacecraft flew past it and gathered unprecedented details, coming close enough to study its nucleus, which is normally concealed by the comet's coma. The roughly potato-shaped, 9-mile-long (15 km) comet contains equal parts ice and dust, with some 80 percent of the ice made of water and about 15 percent of it consisting of frozen carbon monoxide. Researchers believe other comets are chemically similar to Halley's Comet. The nucleus of Halley's Comet was unexpectedly extremely dark black — its surface, and perhaps those of most others, is apparently covered with a black crust of dust over most of the ice, and it only releases gas when holes in this crust expose ice to the sun. The comet Shoemaker-Levy 9 collided spectacularly with Jupiter in 1994, with the giant planet's gravitational pull ripping the comet apart for at least 21 visible impacts. The largest collision created a fireball that rose about 1,800 miles (3,000 km) above the Jovian cloud tops as well as a giant dark spot more than 7,460 miles (12,000 km) across— about the size of the Earth — and was estimated to have exploded with the force of 6,000 gigatons of TNT. A recent, highly visible comet was Hale-Bopp, which came within 122 million miles (197 million km) of Earth in 1997. Its unusually large nucleus gave off a great deal of dust and gas — estimated at roughly 18 to 25 miles (30 to 40 km) across — appeared bright to the naked eye. Comet ISON was expected to give a spectacular show in 2013. However, the sun-grazer did not survive its close encounter with the sun and was destroyed in December.